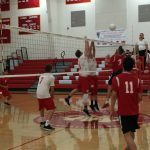 Boys Junior Varsity Volleyball, Boys Varsity Volleyball · May 4 Herald Volleyball wins a one-game playoff to qualify for CIF! 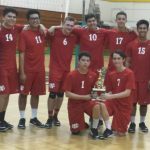 Boys Junior Varsity Volleyball, Boys Varsity Volleyball · Apr 23 JV Boys Volleyball wins the Silver Division of the Kennedy Tournament! Congratulations to Coach Maguire, Coach Coleman and all the guys for winning the Silver Division of the Kennedy High tournament today! Along the way, the Heralds had victories over Tustin, Pacifica, and Bravo. The championship game was a 2-set victory over Western Christian! Thursday, April 14, 2016 4:00 PM Valley Christian/Cerritos AWAY 0 Whittier Christian High School HOME 2 Game Recap The Herald JV Boys Volleyball team defeated Valley Christian in two sets (25-20, 25-19) today in the Leon Davis Event Center. Boys Junior Varsity Volleyball, Boys Varsity Volleyball · Apr 12 Herald Varsity Volleyball sweeps Workman High! Congratulations to the Herald Varsity volleyball team as they swept through Workman today (25-19, 25-5, 25-19). Highlight players in today’s match: Seth Shumate: 8 kills, 12 assists Cade McGee: 7 kills, 7 digs Josh Sorley: 8 kills Justin Osborn: 6 kills, 5 digs, 10 assists The Heralds will next play at HOME Thursday night vs.
Saturday, March 26, 2016 1:00 PM Whittier Christian High School AWAY 2 Liberty Christian Schools HOME 0 Game Recap Heralds defeat Liberty Christian in the first playoff game of today’s Ocean View tournament. 25-4, 25-9.